(1) a man on a white horse, with a bow and a crown, who is a conqueror-- a true "man on horseback"-- this may be the Antichrist. I believe Jupiter symbolizes this horsemen-- in Revelation 13, the Antichrist brings "fire down from heaven". This sounds like Jupiter or Thor with their thunderbolts. Damien Thorne in the "Omen" movies is supposed to be the Antichrist. "Thor" and "Thorne" are certainly very similar words. Possible Antichrist: see this page on Russian President Putin. (2) a red horse, whose rider has a sword -- war. This must be Mars, the red planet symbolizing war. A major concern is that ISIS terrorists could attack in American cities. There is also concern over the Second Horseman War riding in 2019 - 2020 with increased tension in the Middle East with Iran and Syria, ISIS in Iraq and Libya, ISIS terrorism attacks, or Russia invading Ukraine and other former Soviet Union countries, China naval aggression, or a North Korea - South Korea nuclear war. And tensions have risen with China aggressiveness in building offshore islands to expand its territory into the sea. And North Korea was threatening to launch nuclear missiles. Also, concern over Russia launching a missile attack on Europe, or invading other former Soviet Union countries, and North Korea-South Korea tension is a concern. (3) a black horse, whose rider is holding a pair of scales in his hand, symbolizing famine and economic chaos and depression. I would connect this horseman with Saturn, associated in Greek/Roman/Etruscan mythology with agriculture as well as weights and measures and coins. A severe economic recession by 2019 - 2020? The third horseman economic chaos rides in 2019 - 2020? (4) A pale horse, whose rider is named Death, and Hades rides with him. This, obviously is Pluto-- Lord of the Underworld, Land of the Dead, in mythology. It is believed by some writers that the fourth horseman Death is associated more with death by disease: there could be epidemics of: Influenza, SARS and Ebola), Enterovirus D68. Zika Virus can cause brain damage in newborns if the mother got the virus. And riding with the Fourth Horsemen is Hell. Note that on April 23 2009 there was news about a deadly H1N1 Swine Flu outbreak in Mexico, of a new deadly form of swine Flu. It later spread to the U.S. and across the world. Could it become a world Flu pandemic? It is said to sometimes cause severe respiratory illness. Could it be the Fourth Horseman Death starting to ride? If it later mutates into a killer virus like the 1918 Swine Flu. In 2013, a Bird Flu outbreak in China, with some human deaths, H7N9 virus strain. The concern is that it could become a deadly human epidemic, the Fourth Horseman Death riding. Or it could ride as SARS. This page has a King James version Bible Code matrices on these diseases. Consider that the horsemen are "activated" when the planets enter Sagittarius -- who is a combined horse/man. I think it could be this pattern exists mostly after year 1900 -- and many people think the "horsemen" started riding after year 2000. Also, consider the significance of the comet crash on Jupiter. Jupiter was lit up brightly by the comet collision, and if the Antichrist is identified with Jupiter, the Antichrist is none other than Satan or Lucifer on earth. Lucifer means "light-bringer". Also, Satan is represented in the Bible as a star that falls from heaven, like the comet. Severe economic depression, lasting 7 years, began with the Panic of 1837, caused by a series of bank failures. Sept. 24, 1869, a panic in the Gold market, Black Friday, began economic decline. A panic on Wall Street in 1873, producing a severe depression until 1879. The Panic of 1893 produced an economic depression lasting until 1897. This time, we hit the tail end of it. December 24 2014 - June 15 2015, September 19 2015 - December 20 2017. Saturn is in Sagittarius. Robespierre emerges as a leader of the French Revolution in Aug. 1793, resulting in a Reign of Terror, which ended in Aug. 1794. Hitler arrested after his coup fails; this begins his fame. Stalin comes to power. Nixon at his peak, winning election by a landslide. Pluto, Lord of the Underworld (Land of the Dead) would correspond to the fourth horseman, death, in Revelation 6:8, who rides a pale horse, and Hell rides with him. What is interesting about this analogy is that the fourth horseman is a dual horsemen-- and that is exactly what we see with Pluto. Pluto has a single moon Charon, with a diameter more than half of Pluto's; and therefore is almost a dual planet, since its moon is so close to its own size. Charon was the boatman who brought the dead across the River Styx to the Underworld. Looking at the historical record, there does not appear to be an association between Pluto in Sagittarius and death. The reason for this could be that Pluto was not discovered until 1930, and has a 248 year period; I think the pattern of the 4 planets becoming "horsemen" exists basicly over the last 200 years. 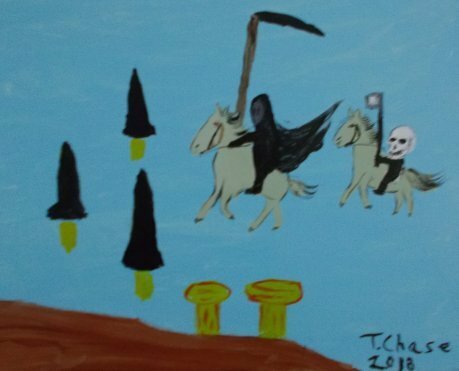 Will the fourth horseman, Death, ride? Possibly in 2019 - 2020 in the form of Influenza (Bird Flu? ), SARS, or Ebola Disease. So the Four Horsemen may ride in 2019 - 2020, I discuss this timetable on this page. - The First Horseman with a bow and a crown, and a conquerer, could be the British Empire, which in 1900 was the largest empire in history, established by conquest, and its ruler wore a crown. - The Second Horseman, a Red Horse, is Communism (which uses the color red as its symbol), which began riding with the Russian Revolution in 1917, and also the Red Horse is war (WW1 and WW2). - The Third Horseman, a Black Horse, economic disaster, began riding with the Great Depression of October 1929. - The Fourth Horsemen, Death. This Fourth Horseman is likely to bring much death in the world in the next few years. April 2019. 66 years, 6 months, (666) since potential Antichrist Putin was born in 1952, could relate to the Antichrist Putin . October 7 2020. Putin the Antichrist is 68 years old. Revelation 6:8 is the man on a pale horse, Death. Could there be a worldwide deadly disease epidemic then, the Fourth Horseman Death riding? Return to the main page for a discussion of the future based on my prophecies, resulting from analyzing with astrology, religion, mythology, the Book of Revelation, and numerical analysis. Included is a calendar of recent past and future events with predictions of world events on key dates. You can watch my videos on subjects discussed on this web site.